The history of Buddhism spans from the 6th century BCE to the present, starting with the birth of the Buddha Siddharta Gautama. This makes it one of the oldest religions practiced today. Throughout this period, the religion evolved as it encountered various countries and cultures, adding to its original Indian foundation Hellenistic as well as Central Asian, East Asian, and Southeast Asian cultural elements. In the process, its geographical extent became considerable so as to affect at one time or another most of the Asian continent. The history of Buddhism is also characterized by the development of numerous movements and schisms, foremost among them the Theravada, Mahāyāna and Vajrayana traditions, punctuated by contrasting periods of expansion and retreat. According to the Buddhist tradition, the historical Buddha Siddharta Gautama was born to the Shakya clan, at the beginning of the Magadha period (546–324 BCE), in the plains of Lumbini, Southern Nepal. He is also known as the Shakyamuni (literally «The sage of the Shakya clan»). After an early life of luxury under the protection of his father, the king of Kapilavastu (later to be incorporated into the state of Magadha), Siddharta entered into contact with the realities of the world and concluded that real life was about unbearable and inescapable suffering and sorrow. Siddharta renounced his meaningless life of luxury to became an ascetic. He ultimately decided that asceticism was also meaningless, and instead chose a middle way, a path of moderation away from the extremes of self-indulgence and self-mortification. Under a fig tree, now known as the Bodhi tree, he vowed never to leave the position until he found Truth. At the age of 35, he attained Enlightenment. He was then known as Gautama Buddha, or simply «The Buddha», which means «the awakened one». For the remaining 45 years of his life, he travelled the Gangetic Plain of central India (region of the Ganges/Ganga river and its tributaries), teaching his doctrine and discipline to an extremely diverse range of people. The Buddha’s reluctance to name a successor or to formalise his doctrine led to the emergence of many movements during the next 400 years: first the schools of Nikaya Buddhism, of which only Theravada remains today, and then the formation of Mahayana, a pan-Buddhist movement based on the acceptance of new scriptures. Before the royal sponsorship of Ashoka in the 3rd century BCE, Buddhism seems to have remained a relatively minor phenomenon, and the historicity of its formative events is poorly established. Two formative councils are supposed to have taken place, although our knowledge of them is based on much later accounts. The councils tend to explain the formalization of the Buddhist doctrine, and the various subsequent schisms inside the Buddhist movement. The first Buddhist council was held soon after the death of the Buddha under the patronage of king Ajatasatru of the Magadha empire, and presided by a monk named Mahakasyapa, at Rajagriha (today’s Rajgir). The objective of the council was to record the Buddha’s sayings (sutra) and codify monastic rules (vinaya): Ananda, one of the Buddha’s main disciples and his cousin, was called upon to recite the discourses of the Buddha, and Upali, another disciple, recited the rules of the vinaya. These became the basis of the Pali Canon, which has been the orthodox text of reference throughout the history of Buddhism. The second Buddhist council was convened by King Kalasoka and held at Vaisali, following conflicts between the traditional schools of Buddhism and a more liberal interpretational movement called the Mahasanghikas.The traditional schools considered the Buddha as a human being who reached enlightenment, which could be most easily attained by monks following the monastic rules and practicing the teaching for the sake of overcoming suffering and attaining Arahantship. The secessionist Mahasangikas, however, tended to consider this approach too individualistic and selfish. They considered the objective of becoming an arhat insufficient, and instead proposed that the only true goal was to reach full buddhahood, in a sense opening the way to future Mahāyāna thought. They became proponents of more relaxed monastic rules, which could appeal to a large majority of monastic and lay people (hence their name the «great» or «majority» assembly). The council ended with the rejection of the Mahasanghikas. They left the council and maintained themselves for several centuries in northwestern India and Central Asia according to Kharoshti inscriptions found near the Oxus and dated c. 1st century CE. The Mauryan king Ashoka (273–232 BCE) converted to Buddhism after his bloody conquest of the territory of Kalinga (today’s Orissa) in the east of India. Regretful of the horrors brought by the conflict, the king decided to renounce violence, and to propagate the faith by building stupas and pillars urging for the respect of all animal life, and enjoining people to follow the Dharma. He also built roads and hospitals around the country. This period marks the first spread of Buddhism beyond India. According to the plates and pillars left by king Ashoka (the Edicts of Ashoka), emissaries were sent to various countries in order to spread Buddhism, as far as the Greek kingdoms in the West, in particular the neighboring Greco-Bactrian Kingdom, and possibly even farther to the Mediterranean according to the stone inscriptions left by Ashoka. King Ashoka convened the third Buddhist council around 250 BCE at Pataliputra (today’s Patna). It was held by the monk Moggaliputta. The objective of the council was to reconcile the different schools of Buddhism, to purify the Buddhist movement, particularly from opportunistic factions which had been attracted by the royal patronage, and to organize the dispatch of Buddhist missionaries throughout the known world. The Pali canon (Tipitaka, or Tripitaka in Sanskrit, literally the «Three Baskets»), which comprises the texts of reference of traditional Buddhism and is considered to be directly transmitted from the Buddha, was formalized at that time. It consists of the doctrine (the Sutra Pitaka), the monastic discipline (Vinaya Pitaka) and an additional new body of subtle philosophy (the Abhidharma Pitaka). The efforts of Ashoka to purify the Buddhist faith also had the effect of segregating against other emerging movements. In particular, after 250 BCE, the Sarvastivadin (who had been rejected by the 3rd council, according to the Theravada tradition) and the Dharmaguptaka schools became quite influential in northwestern India and Central Asia, up to the time of the Kushan Empire in the first centuries of the common era. The Dharmaguptakas were characterized by a belief that Buddha was separate, and above, the rest of the Buddhist community. The Sarvastivadin believed that past, present, and future are all simultaneous. Some of the Edicts of Ashoka inscriptions describe the efforts made by Ashoka to propagate the Buddhist faith throughout the Hellenistic world, which at that time formed an uninterrupted continuum from the borders of India to Greece. The Edicts indicate a clear understanding of the political organization in Hellenistic territories: the names and location of the main Greek monarchs of the time are identified, and they are claimed as recipients of Buddhist proselytism: Antiochus II Theos of the Seleucid Kingdom (261–246 BCE), Ptolemy II Philadelphos of Egypt (285–247 B.C. ), Antigonus Gonatas of Macedonia (276–239 BCE), Magas of Cyrene (288–258 BCE), and Alexander II of Epirus (272–255 BCE). «The conquest by Dharma has been won here, on the borders, and even six hundred yojanas (4,000 miles) away, where the Greek king Antiochos rules, beyond there where the four kings named Ptolemy, Antigonos, Magas and Alexander rule, likewise in the south among the Cholas, the Pandyas, and as far as Tamraparni.» (Edicts of Ashoka, 13th Rock Edict, S. Dhammika). «When the thera (elder) Moggaliputta, the illuminator of the religion of the Conqueror (Ashoka), had brought the (third) council to an end (..) he sent forth theras, one here and one there: (..) and to Aparantaka (the «Western countries» corresponding to Gujarat and Sindh) he sent the Greek (Yona) named Dhammarakkhita«. (Mahavamsa XII). It is not clear how much these interactions may have been influential, but some authors have commented that some level of syncretism between Hellenist thought and Buddhism may have started in Hellenic lands at that time. They have pointed to the presence of Buddhist communities in the Hellenistic world around that period, in particular in Alexandria (mentioned by Clement of Alexandria), and to the pre-Christian monastic order of the Therapeutae (possibly a deformation of the Pali word «Theravada«), who may have «almost entirely drawn (its) inspiration from the teaching and practices of Buddhist asceticism» (Robert Lissen). Buddhist gravestones from the Ptolemaic period have also been found in Alexandria, decorated with depictions of the Dharma wheel (Tarn, «The Greeks in Bactria and India»). Commenting on the presence of Buddhists in Alexandria, some scholars have even pointed out that â€œIt was later in this very place that some of the most active centers of Christianity were establishedâ€? (Robert Linssen «Zen living»). In the areas east of the Indian subcontinent (today’s Burma), Indian culture strongly influenced the Mons. The Mons are said to have been converted to Buddhism around 200 BCE under the proselytizing of the Indian king Ashoka, before the fission between Mahayana and Hinayana Buddhism. Early Mon Buddhist temples, such as Peikthano in central Burma, have been dated between the 1st and the 5th century CE. The Buddhist art of the Mons was especially influenced by the Indian art of the Gupta and post-Gupta periods, and their mannerist style spread widely in South-East Asia following the expansion of the Mon kingdom between the 5th and 8th centuries. The Theravada faith expanded in the northern parts of Southeast Asia under Mon influence, until it was progressively displaced by Mahayana Buddhism from around the 6th century CE. Sri Lanka was allegedly proselytized by Ashoka’s son Mahinda and six companions during the 2nd century BCE. They converted the king Devanampiva Tissa and many of the nobility. This is when the Mahavihara monastery, a center of Sinhalese orthodoxy, was built. The Pali Canon was put in writing in Sri Lanka during the reign of king Vittagamani (r. 29–17 BCE), and the Theravada tradition flourished there, harbouring some great commentators such as Buddhaghosa (4th–5th century). Although Mahayana Buddhism gained some influence at that time, Theravada ultimately prevailed, and Sri Lanka turned out to be the last stronghold of Theravada Buddhism, from where it would expand again to South-East Asia from the 11th century. There is also a legend, not directly validated by the edicts, that Ashoka sent a missionary to the north, through the Himalayas, to Khotan in the Tarim Basin, then the land of an Indo-European people, the Tocharians. The Sunga dynasty (185–73 BCE) was established in 185 BCE, about 50 years after Ashoka’s death. After murdering King Brhadrata (last of the Mauryan rulers), military commander-in-chief Pusyamitra Sunga took the throne. An orthodox Brahmin, Sunga is known for his hostility and persecution towards the Buddhist faith. He is recorded as having «destroyed monasteries and killed Monks» (Divyavadana, pp. 429–434): 84,000 Buddhist stupas which had been built by Ashoka were destroyed (R. Thaper), and 100 gold coins were offered for the head of each Buddhist monk (Indian Historical Quarterly Vol. XXII, p. 81 ff cited in Hars.407). A large number of Buddhist monasteries (viharas) were converted to Hindu temples, in such places as Nalanda, Bodhgaya, Sarnath, or Mathura. In the areas west of the Indian subcontinent, neighboring Greek kingdoms had been in place in Bactria (today’s northern Afghanistan) since the time of the conquests of Alexander the Great around 326 BCE: first the Seleucids from around 323 BCE, then the Greco-Bactrian kingdom from around 250 BCE. The Greco-Bactrian king Demetrius I invaded India in 180 BCE as far as Pataliputra, establishing an Indo-Greek kingdom that was to last in various part of northern India until the end of the 1st century BCE.Buddhism flourished under the Indo-Greek kings, and it has been suggested that their invasion of India was intended to show their support for the Mauryan empire, and to protect the Buddhist faith from the religious persecutions of the Sungas (185–73 BCE). One of the most famous Indo-Greek kings is Menander (reigned c. 160–135 BCE). He apparently converted to Buddhism and is presented in the Mahayana tradition as one of the great benefactors of the faith, on a par with king Ashoka or the later Kushan king Kanishka. Menander’s coins bear the mention «Saviour king» in Greek, and sometimes designs of the eight-spoked wheel. Direct cultural exchange is also suggested by the dialogue of the Milinda Panha between Menander and the monk Nagasena around 160 BCE. Upon his death, the honour of sharing his remains was claimed by the cities under his rule, and they were enshrined in stupas, in a parallel with the historic Buddha (Plutarch, Praec. reip. ger. 28, 6). Several of Menander’s Indo-Greek successors inscribed the mention «Follower of the Dharma» in the Kharoshthi script on their coins, and depicted themselves or their divinities forming the vitarka mudra. The interaction between Greek and Buddhist cultures may have had some influence on the evolution of Mahayana, as the faith developed its sophisticated philosophical approach and a man-god treatment of the Buddha somewhat reminiscent of Hellenic gods. 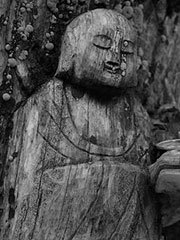 It is also around that time that the first anthropomorphic representations of the Buddha are found, often in realistic Greco-Buddhist style: «One might regard the classical influence as including the general idea of representing a man-god in this purely human form, which was of course well familiar in the West, and it is very likely that the example of westerner’s treatment of their gods was indeed an important factor in the innovation» (Boardman, «The Diffusion of Classical Art in Antiquity» ). The rise of Mahayana Buddhism from the 1st century BCE was accompanied by complex political changes in northwestern India. The Indo-Greek kingdoms were gradually overwhelmed, and their culture assimilated by Indo-European nomad migrants from Central Asia, the Indo-Scythians, and then the Yuezhi, who founded the Kushan Empire from around 12 BCE.The Kushans were supportive of Buddhism, and a fourth Buddhist council was convened by the Kushan emperor Kanishka, around 100 CE at Jalandhar or in Kashmir, and is usually associated with the formal rise of Mahayana Buddhism and its secession from Theravada Buddhism. Theravada Buddhism does not recognize the authenticity of this council, and it is sometimes called the «council of heretical monks». It is said that Kanishka gathered 500 bhikkhus in Kashmir, headed by Vasumitra, to edit the Tripitaka and make references and remarks. Allegedly, during the council there were all together three hundred thousand verses and over nine million statements compiled, and it took twelve years to complete. This council did not rely on the original Pali canon (the Tipitaka). Instead, a set of new scriptures was approved, as well as fundamental principles of Mahayana doctrine. The new scriptures, usually in the Gandhari vernacular and the Kharosthi script, were rewritten in the classical language of Sanskrit, to many scholars a turning point in the propagation of Buddhist thought. The new form of Buddhism was characterized by an almost God-like treatment of the Buddha, by the idea that all beings have a Buddha-nature and should aspire to Buddhahood, and by a syncretism due to the various cultural influences within northwestern India and the Kushan Empire. From that point on, and in the space of a few centuries, Mahayana was to flourish and spread in the East from India to South-East Asia, and towards the north to Central Asia, China, Korea, and finally to Japan in 538 CE. After the end of the Kushans, Buddhism flourished in India during the dynasty of the Guptas (4th–6th century). Mahayana centers of learning were established, especially at Nalanda in north-eastern India, which was to become the largest and most influential Buddhist university for many centuries, with famous teachers such as Nagarjuna. The Gupta style of Buddhist art became very influential from South-East Asia to China as the faith was spreading there. Indian Buddhism weakened in the 7th century following White Hun and Islamic invasions. However, it enjoyed a strong revival under the Pala Empire, in which Mahayana Buddhism flourished between the 8th and the 12th century. The Palas created many temples and a distinctive school of Buddhist art. A milestone in the decline of Indian Buddhism occurred in 1193 when Turkic Islamic raiders under Muhammad Khilji destroyed Nalanda. By the end of the 12th century, following the Islamic conquest of the Buddhist strongholds in Bihar, Buddhists ceased to be a significant presence in India. Additionally, the influence of Buddhism also waned due to Hinduism’s revival movements such as Advaita and the rise of the bhakti movement. Despite being born in India, at the dawn of the 20th century, Buddhism was followed only in a few isolated areas of that country. Central Asia had been influenced by Buddhism probably almost since the time of the Buddha. According to a legend preserved in Pali, the language of the Theravada canon, two merchant brothers from Bactria, named Tapassu and Bhallika, visited the Buddha and became his disciples. They then returned to Bactria and built temples to the Buddha (Foltz). Central Asia long played the role of a meeting place between China, India and Persia. During the 2nd century BCE, the expansion of the Former Han to the west brought them into contact with the Hellenistic civilizations of Asia, especially the Greco-Bactrian Kingdoms. Thereafter, the expansion of Buddhism to the north led to the formation of Buddhist communities and even Buddhist kingdoms in the oases of Central Asia. Some Silk Road cities consisted almost entirely of Buddhist stupas and monasteries, and it seems that one of their main objectives was to welcome and service travelers between east and west. Various Nikaya schools persisted in Central Asia and China until around the 7th century CE. Mahayana started to become dominant during the period, but since the faith had not developed a Nikaya approach, Sarvastivadin and Dharmaguptakas remained the Vinayas of choice in Central Asian monasteries. Buddhism in Central Asia started to decline with the expansion of Islam in the area from the 7th century. The Muslims did not show to the Buddhists the tolerance that they had for other religions «of the Book», such as Christianity or Judaism. Instead they considered Buddhists to be practitioners of idolatry, and tended to persecute them harshly. The eastern part of central Asia (Chinese Turkestan, Tarim Basin, Xinjiang) has revealed extremely rich Buddhist works of art (wall paintings and reliefs in numerous caves, portable paintings on canvas, sculpture, ritual objects), displaying multiple influences from Indian and Hellenistic cultures. Serindian art is highly reminiscent of the Gandharan style, and scriptures in the Gandhari script Kharosthi have been found. Central Asians seem to have played a key role in the transmission of Buddhism to the East. The first translators of Buddhists scriptures into Chinese were either Parthian (Ch: Anxi) like An Shigao (c. 148 CE) or An Hsuan, Kushan of Yuezhi ethnicity like Lokaksema (c. 178 CE), Zhi Qian and Zhi Yao, or Sogdians (Ch: Kangju) like Kang Sengkai. Thirty-seven early translators of Buddhist texts are known, and the majority of them have been identified as Central Asians. Central Asian and East Asian Buddhist monks appear to have maintained strong exchanges until around the 10th century, as shown by frescoes from the Tarim Basin. These influences were rapidly absorbed however by the vigorous Chinese culture, and a strongly Chinese particularism develops from that point. Buddhism probably arrived in China around the 1st century CE from Central Asia (although there are some traditions about a monk visiting China during Asoka’s reign), and through to the 8th century it became an extremely active center of Buddhism. The year 67 CE saw Buddhism’s official introduction to China with the coming of the two monks Moton and Chufarlan. In 68 CE, under imperial patronage, they established the White Horse Temple (白馬寺), which still exists today, close to the imperial capital at Luoyang. By the end of the second century, a prosperous community had been settled at Pengcheng (modern Xuzhou, Jiangsu). Buddhism flourished during the beginning of the Tang dynasty (618–907). The dynasty was initially characterized by a strong openness to foreign influences, and renewed exchanges with Indian culture due to the numerous travels of Chinese Buddhist monks to India from the 4th to the 11th century. The Tang capital of Chang’an (Today’s Xi’an) became an important center for Buddhist thought. From there Buddhism spread to Korea, and Japanese embassies of Kentoshi helped gain footholds in Japan. However foreign influences came to be negatively perceived towards the end of the Tang dynasty. In the year 845, the Tang emperor Wu-Tsung outlawed all «foreign» religions (including Christian Nestorianism, Zoroastrianism, and Buddhism) in order to support the indigenous Taoism. Throughout his territory, he confiscated Buddhist possessions, destroyed monasteries and temples, and executed Buddhist monks, ending Buddhism’s cultural and intellectual dominance. Pure Land and Chan Buddhism, however, continued to prosper for some centuries, the latter giving rise to Japanese Zen. In China, Chan flourished particularly under the Song dynasty (1127–1279), when its monasteries were great centers of culture and learning. Today, China boosts one of the richest collections of Buddhist arts and heritages in the world. UNESCO World Heritage Sites such as the Mogao Caves near Dunhuang in Gansu province, the Longmen Grottoes near Luoyang in Henan province, the Yungang Grottoes near Datong in Shanxi province, and the Dazu Stone Carvings near Chongqing are among the most important and renowned Buddhist sculptural sites. The Leshan Giant Buddha, carved out of a hillside in the 8th century during Tang Dynasty and looking down on the confluence of three rivers, is still the largest stone Buddha statue in the world. Buddhism was introduced around 372 CE, when Chinese ambassadors visited the Korean kingdom of Goguryeo, bringing scriptures and images.Buddhism prospered in Korea, and in particular Seon (Zen) Buddhism from the 7th century onward.However, with the beginning of the Confucean Yi Dynasty of the Joseon period in 1392, Buddhism was strongly discriminated against until it was almost completely eradicated, except for a remaining Seon movement. Japan, the largest Buddhist country today, discovered Buddhism in the 6th century when monks traveled to the islands together with numerous scriptures and works of art. The Buddhist religion was adopted by the state in the following century. Being geographically at the end of the Silk Road, Japan was able to preserve many aspects of Buddhism at the very time it was disappearing in India, and being suppressed in Central Asia and China. From 710 CE numerous temples and monasteries were built in the capital city of Nara, such as the five-story pagoda and Golden Hall of the Horyuji, or the Kofuku-ji temple. Countless paintings and sculptures were made, often under governmental sponsorship. The creation of Japanese Buddhist art was especially rich between the 8th and 13th century during the periods of Nara, Heian, and Kamakura. From the 12th and 13th, a further development was Zen art, following the introduction of the faith by Dogen and Eisai upon their return from China. Zen art is mainly characterized by original paintings (such as sumi-e and the Enso) and poetry (especially haikus), striving to express the true essence of the world through impressionistic and unadorned «non-dualistic» representations. The search for enlightenment «in the moment» also led to the development of other important derivative arts such as the Chanoyu tea ceremony or the Ikebana art of flower arrangement. This evolution went as far as considering almost any human activity as an art with a strong spiritual and aesthetic content, first and foremost in those activities related to combat techniques (martial arts). Buddhism remains very active in Japan to this day. Around 80,000 Buddhist temples are preserved and regularly restored. During the 1st century CE, the trade on the overland Silk Road tended to be restricted by the rise in the Middle-East of the Parthian empire, an unvanquished enemy of Rome, just as Romans were becoming extremely wealthy and their demand for Asian luxury was rising. This demand revived the sea connections between the Mediterranean and China, with India as the intermediary of choice. From that time, through trade connection, commercial settlements, and even political interventions, India started to strongly influence Southeast Asian countries. Trade routes linked India with southern Burma, central and southern Siam, lower Cambodia and southern Vietnam, and numerous urbanized coastal settlements were established there. For more than a thousand years, Indian influence was therefore the major factor that brought a certain level of cultural unity to the various countries of the region. The Pali and Sanskrit languages and the Indian script, together with Theravada and Mahayana Buddhism, Brahmanism, and Hinduism, were transmitted from direct contact and through sacred texts and Indian literature such as the Ramayana and the Mahabharata. From the 5th to the 13th century, South-East Asia had very powerful empires and became extremely active in Buddhist architectural and artistic creation. The main Buddhist influence now came directly by sea from the Indian subcontinent, so that these empires essentially followed the Mahayana faith. The Sri Vijaya Empire to the south and the Khmer Empire to the north competed for influence, and their art expressed the rich Mahayana pantheon of the Bodhisattvas. Srivijaya, a maritime empire centered at Palembang on the island of Sumatra in Indonesia, adopted Mahayana and Vajrayana Buddhism under a line of rulers named the Sailendras. Yijing described Palembang as a great centre of Buddhist learning where the emperor supported over a thousand monks at his court. Atisha studied there before travelling to Tibet as a missionary. Sriviijaya spread Buddhist art during its expansion in Southeast Asia. Numerous statues of Bodhisattvas from this period are characterized by a very strong refinement and technical sophistication, and are found throughout the region. Extremely rich architectural remains are visible at the temple of Borobudur (the largest Buddhist structure in the world, built from around 780 CE), in Java, which has 505 images of the seated Buddha. Srivijaya declined due to conflicts with the Chola rulers of India, before being destabilized by the Islamic expansion from the 13th century. Later, from the 9th to the 13th century, the Mahayana Buddhist and Hindu Khmer Empire dominated much of the South-East Asian peninsula. Under the Khmer, more than 900 temples were built in Cambodia and in neighboring Thailand. Angkor was at the center of this development, with a temple complex and urban organization able to support around one million urban dwellers. One of the greatest Khmer kings, Jayavarman VII (1181–1219), built large Mahayana Buddhist structures at Bayon and Angkor Thom. Following the destruction of Buddhism in mainland India during the 11th century, Mahayana Buddhism declined in Southeast Asia, to be replaced by the introduction of Theravada Buddhism from Sri Lanka. VajrayÄ?na Buddhism, also called Tantric Buddhism, first emerged in eastern India between the 5th and 7th centuries CE. It is sometimes considered a sub-school of Mahayana and sometimes a third major «vehicle» (Yana) of Buddhism in its own right. The Vajrayana is an extension of Mahayana Buddhism in that it does not offer new philosophical perspectives, but rather introduces additional techniques (upaya, or ‘skilful means’), including the use of visualizations and other yogic practices. Many of the practices of Tantric Buddhism are also derived from Brahmanism (the usage of mantras, yoga, or the burning of sacrificial offerings). Early Vajrayana practitioners were forest-dwelling mahasiddas who lived on the margins of society, but by the 9th century Vajrayana had won acceptance at major Mahayana monastic universities such as Nalanda and Vikramshila. Along with much of the rest of Indian Buddhism, the Vajrayana was eclipsed in the wake of the late 12th century Muslim invasions. It has persisted in Tibet, where it was wholly transplanted from the 7th to 12th centuries and became the dominant form of Buddhism to the present day, and on a limited basis in Japan as well where it evolved into Shingon Buddhism. From the 11th century, the destruction of Buddhism in the Indian mainland by Islamic invasions led to the decline of the Mahayana faith in South-East Asia. Continental routes through the Indian subcontinent being compromised, direct sea routes between the Middle-East through Sri Lanka and to China developed, leading to the adoption of the Theravada Buddhism of the Pali canon, introduced to the region around the 11th century CE from Sri Lanka. King Anawrahta (1044–1077), the historical founder of the Burmese empire, unified the country and adopted the Theravada Buddhist faith. This initiated the creation of thousands of Buddhist temples at Pagan, the capital, between the 11th and 13th century. Around 2,000 of them are still standing. The power of the Burmese waned with the rise of the Thai, and with the seizure of the capital Pagan by the Mongols in 1287, but Theravada Buddhism remained the main Burmese faith to this day. The Theravada faith was also adopted by the newly founded ethnic Thai kingdom of Sukhothai around 1260. Theravada Buddhism was further reinforced during the Ayutthaya period (14th–18th century), becoming an integral part of the Thai society. In the continental areas, Theravada Buddhism continued to expand into Laos and Cambodia in the 13th century. However, from the 14th century, on the coastal fringes and in the islands of South-East Asia, the influence of Islam proved stronger, expanding into Malaysia, Indonesia, and most of the islands as far as the southern Philippines. However, since 1966 with Soeharto’s rise of power in the aftermath of the bloody events after the so called «September 30th, 1965 murders», allegedly executed by the Communists Party, there has been a remarkable renaissance of Buddhism in Indonesia. This is partly due to the Soeharto’s New Order’s requirements for the people of Indonesia to adopt one of the five official religions: Islam, Protestantism, Catholicism, Hinduism or Buddhism. Today it is estimated there are some 10 millions Buddhists in Indonesia. A large part of them are people of Chinese ancestry. After the Classical encounters between Buddhism and the West recorded in Greco-Buddhist art, information and legends about Buddhism seem to have reached the West sporadically. During the 8th century, Buddhist Jataka stories were translated into Syriac and Arabic as Kalilag and Damnag. An account of Buddha’s life was translated in to Greek by John of Damascus, and widely circulated to Christians as the story of Barlaam and Josaphat. By the 1300s this story of Josaphat had become so popular that he was made a Catholic saint. The next direct encounter between Europeans and Buddhism happened in Medieval times when the Franciscan friar William of Rubruck was sent on an embassy to the Mongol court of Mongke by the French king Saint Louis in 1253. The contact happened in Cailac (today’s Qayaliq in Kazakhstan), and William originally thought they were wayward Christians (Foltz, «Religions of the Silk Road»). Major interest for Buddhism emerged during colonial times, when Western powers were in a position to witness the faith and its artistic manifestations in detail. European philosophy was strongly influenced by the study of oriental religions during that period. The opening of Japan in 1853 also created a considerable interest for the arts and culture of Japan, and provided access to one of the most thriving Buddhist cultures in the world. Buddhism started to enjoy a strong interest from the general population in the West during the 20th century, following the perceived failure of social utopias, from Fascism to Marxism. After the Second World War, the focus of progress tended to shift to personal self-realization, on the material as well as spiritual plane. In this context, Buddhism has been displaying a strong power of attraction, due to its tolerance, its lack of deist authority and determinism, and its focus on understanding reality through self inquiry. According to the latest census it is now the fastest growing religion in Britain. «National Museum Arts asiatiques- Guimet» (Editions de la Reunion des MusĂ©es Nationaux, Paris, 2001) ISBN 2711838978.